Another 4 goals, another Bundesliga victory as Tuchel took his side to the top of the Bundesliga with a dominant win over newly-promoted Ingolstadt. The two formations at the beginning of the game. Again BVB set themselves out in their 4-2-3-1 cross 4-1-4-1 formation with just two changes from their opening day demolition of Gladbach as Ginter came in for Piszczek and Subotic returned from injury to take Sokratis’ position,. Roman Burki reclaimed his spot as Dortmund’s number 1 and was near-completely untested behind a back 4 of Schmelzer, Hummels, the newly-returned Subotic and Ginter who scored the opener in the second half. Julian Weigl deservedly kept Bender out of the side as he again started as Dortmund’s 6 after an excellent league debut at home to Gladbach whilst Gundogan also featured for the 2nd consecutive league game to his right as their 8. Shinji Kagawa formed the top of the triangle in his role as Dortmund’s 10, scoring their third goal to top off another good performance. To his left sat Mkhitaryan who has been one of Dortmund’s best players so far now under new manager Tuchel. The Armenian attacking midfielder has featured on the left of Dortmund’s midfield and plays a key role in their penetrations down the left – something which has been a common feature of their possession game so far. Marco Reus returned on the right after being rested from travelling to play Norweigan side Odd Ballklubb in the Europe League, whilst Aubameyang scored again as the lone striker. The first 15 minutes of the game were somewhat frantic and most of it was spent in transition as both sides struggled to maintain any possession. Ingolstadt in particular were pressing aggressively and made themselves known to the likes of Weigl and Mkhitaryan who were both the target of some strong challenges. Likewise Dortmund were pressing without the ball though, especially considering Ingolstadt’s direct passing, not with the same level of intensity. Some of Dortmund’s issues in possession were as a result of their own doing, with little influence from the Ingolstadt defence. Both collectively and individually there were a number of cases of poor decision making, such as a tendency to move the ball into wide areas early in possession despite no decisive pressure from the opposition. During this period of the game there were a number of occassions where Dortmund looked to make a quick break after regaining possession but didn’t have a good structure for doing so and ultimately they broke down. The result was at times a near-tennis match of long balls where accuracy was a rarity. Dortmund struggled yet still kept attempting to make attacking transitions from situations such as this. In this situation we can see a lack of presence in the centre as Aubameyang has strangely decided to move to the area with the weakest strategical value considering the situation and ball position. One could also critique Gundogan’s choice of pass instead of a more stable shorter pass to better build through combination. That being said there is a lack of support with both Mkhitaryan and Reus moving away leaving Kagawa the only realistic option to provide benefit to the counter. The home side defended with intensity, especially early on, and through their use of a man-marking pressing scheme were able to target specific players who are key to Dortmund’s early possession. They in particular looked to target the likes of Weigl, who showed his importance last week as he aids the connections to progress the ball upfield securely and effectively and Mkhitaryan who is key in possession down the left where he aids in combinations with Schmelzer and Kagawa. Their forward Hinterseer was relatively loose in his marking responsibilties and would press the ball-near centre-back as well as situationally the goalkeeper Burki. Behind him however the marking was much more strict with the 2nd and at times the 3rd lines covered with Weigl in particular the recipient of aggressive challenges. Throughout the game, Ingolstadt severely lacked stability in their press, especially once the 1st line had been passed and this was exposed the moment that they lost defensive access. Their loss of access happened commonly enough on its own though it was encouraged by some intelligent horizontal ball circulation from Dortmund as they waited for the inevitable. The most common occurence of this however came through a failure in a 1v1 challenge as the whole defensive strategy crumbled in just one of man-marking’s many disadvantages. In this hypothetical situation, the defending team is marking man-for-man and the presser loses the challenge against the ball-carrier. The defender is beat and the structure loses its stability. Because of one player losing out in the battle with his marking assignment, the whole structure loses its stability as the ball-carrier now is entirely free with central space to move into. The fact that the scheme is so reliant on the actions of one player is a significant deficiency especially coming up against an opposition who possess the intelligence to exploit it; Tuchel’s Dortmund have little issue in that. A case of the above happening in the match. This happened on a few cases during the game, such as the moment both – with needle players such as Kagawa and Mkhitaryan it was somewhat inevitable. With Mkhitaryan dropping to support the connections in early possession, he receives the ball from Hummels and neatly dribbles through two Ingolstadt midfielders. Through this the defensive security disappears as massive spaces in the centre open up whilst the ball-near part of the defensive line is completely occupied by Dortmund players already. After Reus’ penalty to make it 2-0, there was a reaction by Ingolstadt as they increased the intensity of their pressing, looking to fight their way back into the side. This was done rather recklessly considering the game state and as a result wasn’t very effective – there was a distinct lack of preparation in the press and thus it lacked security as Dortmund passed through it with relative ease. Through the opening period of the game it was difficult to decipher the exact strategy of Dortmund in possession due to the scrappy nature of the game. A lot of the first 15 minutes was spent in transitions with the ball not really being controlled by either team which was executed partially by Ingolstadt curtailing the influence of a few of Dortmund’s key players in early possession. However as soon as Dortmund broke the lines of Ingolstadt pressure the away side penetrated well and create a number of threatening attacks early on. Soon enough it unsurprisingly emerged to be a similar left-sided focus which has also been central to their possession game in the past two matches. This will definitely have been influenced by the two most threatening breakthroughs of the opening 30 minutes coming from diagonals to the left flank, firstly through Schmelzer and later Reus who both played cutbacks to set teammates up with clear chances. As the game developed and Dortmund became more settled in possession, they kept looking towards this side of the pitch and benefited well from it. Diagonal passing again played an important role and was the means of quite a lot of the attacks down the left in a similar fashion to their performances against Gladbach and Odd BK. There was another tactic which was more prevalent however in comparison to the past two performances as against Ingolstadt, Tuchel’s side also looked to penetrate the left through overloads also. Reus made frequent ball-oriented movements and would travel far away from his right-wing position whilst Kagawa made small shifts to the left half-space where Mkhitaryan also was situated. This was then supported by the tilting movements of Weigl and Hummels also shifting slightly to the flank whilst Schmelzer’s aggressive positioning maintained the width as well as partially occupying the defensive line to some extent. Dortmund’s tactic to overload the left half-space and parts of the wing space. An in-game example of Dortmund’s left overloads. From these moments, switches to the right wing were also quite effective with one resulting in the opening goal through a nice 1v1 success by Ginter. In the Europe League this was attempted occasionally but was generally ineffective due to connection issues as well as individual weaknesses. Seemingly it was more successful against Ingolstadt as the prior overloads were more effective, causing more focus from the opposition whilst Gundogan supported the spacing much more effectively. These switches weren’t always from half-space to half-space either and at times would stop at Gundogan. 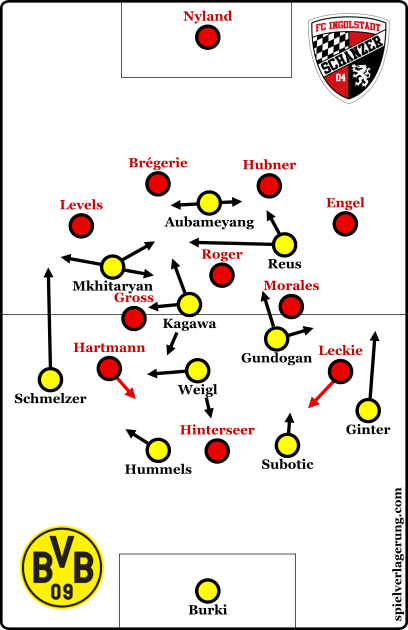 With the 3 of Reus, Kagawa and Mkhitaryan all shifted to the left half-space, at times they attracted the attention of the whole Ingolstadt midfield which opened the central channel for Gundogan to drive into with the ball. 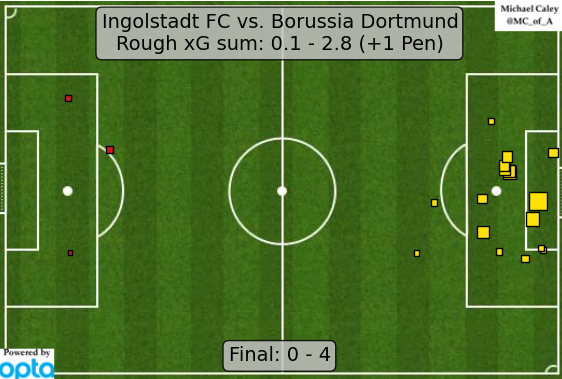 Another more general tactic of Dortmund’s was set to exploit the man-marking scheme of Ingolstadt. Even at 0-0 with many chances squandered, they were still relatively content and patient in their build-up as they used horizontal ball circulation to move the opposition block. Using this as a tool in their strategy they would do this to disorganise the Ingolstadt scheme and then use these moments to penetrate through vertical and more direct diagonal passing into the defensive block. Because of the issues with Ingolstadt’s pressing which I mentioned above, their loss of access and/or stability occurred commonly enough for this to be utilised as a reliable and sustainable tactic in opening up the defensive block. It was yet another dominating performance from Tuchel’s Dortmund, as the great Michael Caley’s expected goal map displays how superior the away side were over the opposition. Michael Caley’s expected goals map. Expected goals is a relatively new stat in football which works to find the value of a shot (how many goals it is worth) through analysing the situation it was taken in – such as shot position, speed of attack and assist type. In the above map, the bigger the square the more value the shot has. Although of course it is early, Tuchel has seemingly progressed the side well from where they finished last year and deservedly end the 2nd match day at the top of the Bundesliga. They came up against some weak opposition as Ingolstadt have just been promoted into the German top flight and this showed. Credit must be given to BVB though for a performance in which they controlled the game for the large majority of the match through the possession game which has developed well since Tuchel’s arrival. Dortmund look more composed and deadly in possession in comparison to last year, definitely looking to control the possession and the game instead of the machine like, press and direct attack approach of Klopp. Tuchel has definitely improved BVB, however it will be interesting to see them play Bayern and Wolfsburg, with Bayern loving the possession themselves and Wolfsburg showing their ability for the big games (4-1 against Bayern and 2-0 against Dortmund in the German Cup final). A question: Do you feel BVB can potentially win the Bundesliga? It’s a long ask, and I think they can definitely qualify for Champions League. Even if they were able to play out their strategy the whole season, there are some players with no proper backup at the moment. Such as Weigl, Mhkitaryan and Gündogan.